The Bourtzi, the octagonal tower at the edge of Methoni Castle. 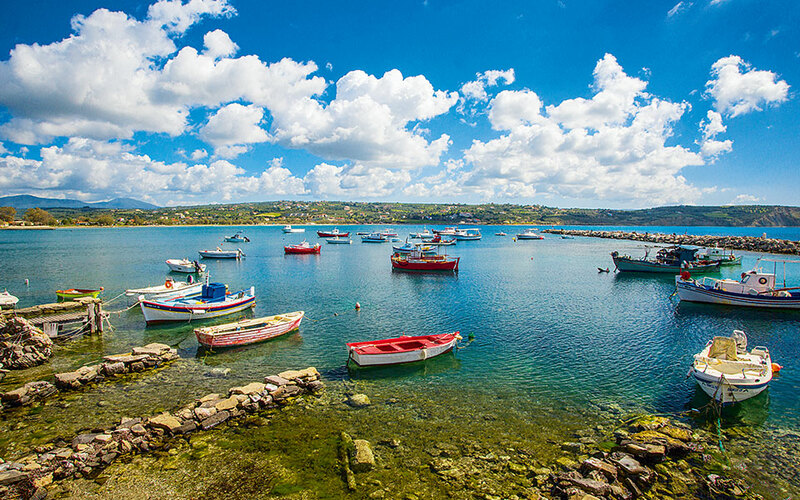 The two castle-towns of Messinia, Methoni and Koroni, complement one another making for a perfect summer getaway. 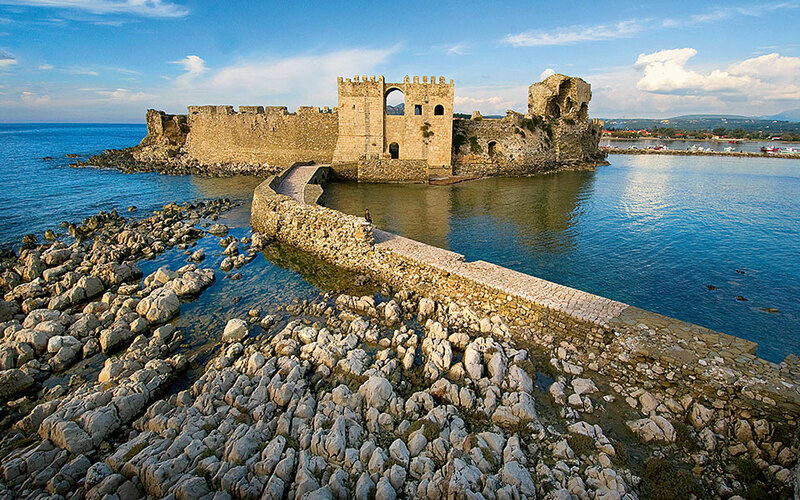 Strategically situated Methoni and Koroni were long prized jewels of the Republic of Venice. The two small towns in the southwestern Peloponnese are only a half-hour drive from each other, and always had a common fate. Their castles flourished during the Venetian occupation (under Venetian rule from 1207 – 1500), developing into important stops for merchant ships traveling from the West to the East, as well as for pilgrims heading to the Holy Land. Today they complement one another as destinations. Some of the long sandy beaches in the area are important nesting sites for Caretta caretta turtles, while others – particularly around Methoni – attract surfers and windsurfers. The moment the wind picks up, you will find them congregating on the beach, some coming all the way from Athens. 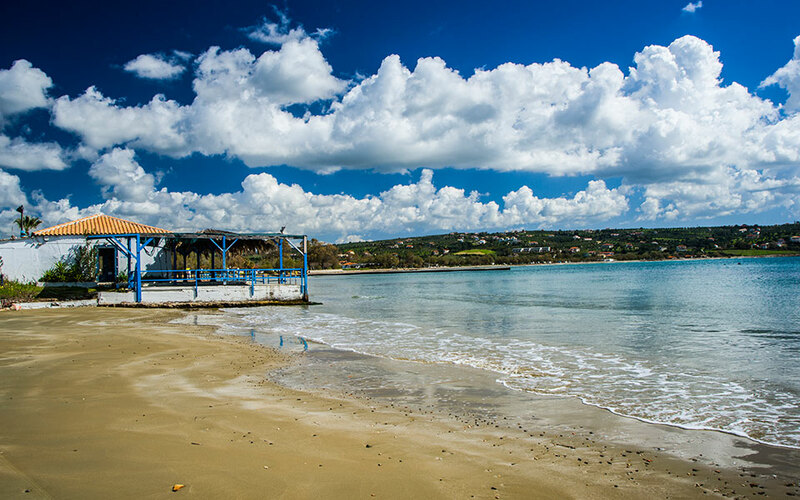 Between Methoni and Koroni, the beach of Foinikounta has been developed in recent years, with many rented rooms and tavernas along its length. Makryammos stands out for its sand dunes and belongs to the Natura 2000 network of environmentally protected sites. Lampes, Marathi and many more beaches in the area are also highly worth exploring. To drive from Athens estimate about 3.5 hours and a cost of 120 euros (gas and tolls for a round trip). After Kalamata choose your route depending on whether you want to visit Methoni (285km from Athens) or Koroni (282km from Athens) first. 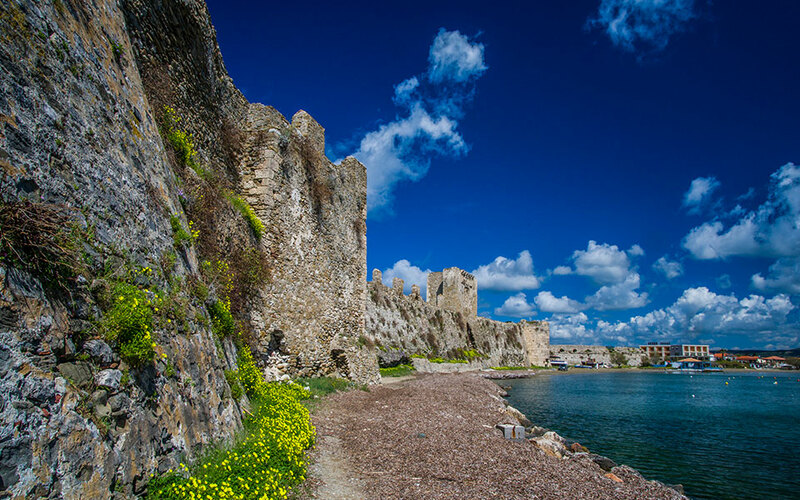 The castle of Methoni is one of the most important fortress complexes in Greece, and today is a beautiful archaeological site that covers 9.3 hectares and ends at the Bourtzi, an octagonal tower surrounded by the sea on all sides. The walk begins at the imposing gate of the castle, along the length of which survive two domed buildings that housed Ottoman baths, the base of a ruined minaret and other traces of its centuries-long history. 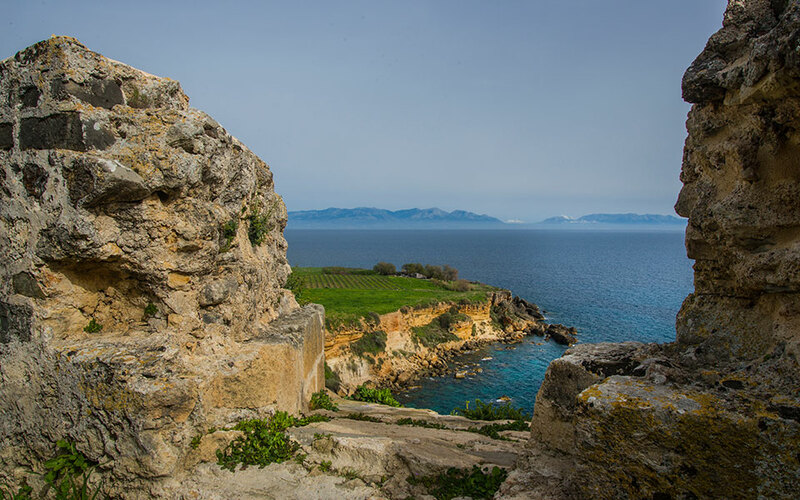 Methoni was once an important citadel, with large numbers of people living within its walls. Indeed in the foundations and walls of the first buildings of the modern town built beginning in 1828, large stones were used that were salvaged from the old homes in the castle. Today the small town of 1,200 residents is built next to its castle, comprising mainly low-rise buildings with ceramic-tiled roofs. It lives mainly off of tourism, both seasonal and not. Its castle is inspiring. You won’t run into any knights, but you will hear the story of Ioannis Koutroulis. He was a knight in the late 14th century who, legend has it, waited seven years until the love of his life was finally able to get a divorce allowing them to marry. When she did what followed was a wedding so epic that it became a part of the vernacular – to this day the phrase “like the wedding of Koutroulis” is used to describe particularly high-spirited affairs. Every year on the long weekend of Clean Monday the wedding is reenacted with authentic Venetian costumes from the active cultural association of Methoni. The association has also recently created a fustanella workshop to preserve the art of creating these pleated white kilts traditionally worn by Greek men. In the summers they also organize festivals in the castle’s moat. A protected anchorage next to the castle of Methoni. From the spring onwards, visitors begin to arrive in Methoni. 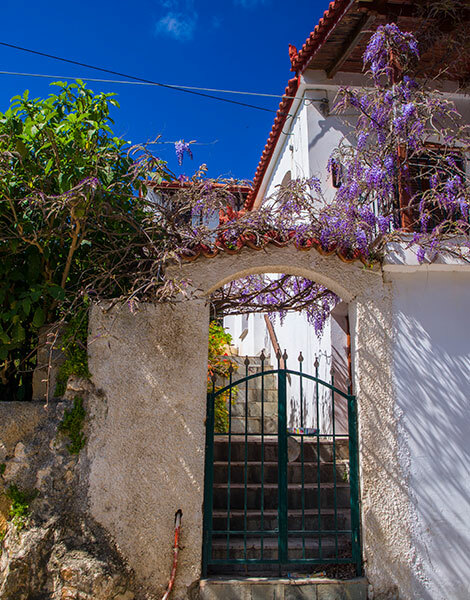 Until then, the 3-4 tavernas that stay open year-round cater almost exclusively to the British, German, Dutch and French pensioners who have built country homes on the nearby hill of Tapia. For them, a life-long dream has come true and they often spend up to 9-10 months of the year here. On Thursday evening the taverna Palia Istoria is full and we are the only Greeks. On Friday it is the same story at a different taverna, Kastro. “If it wasn’t for the foreigners we would be closed during the week,” says the owner. 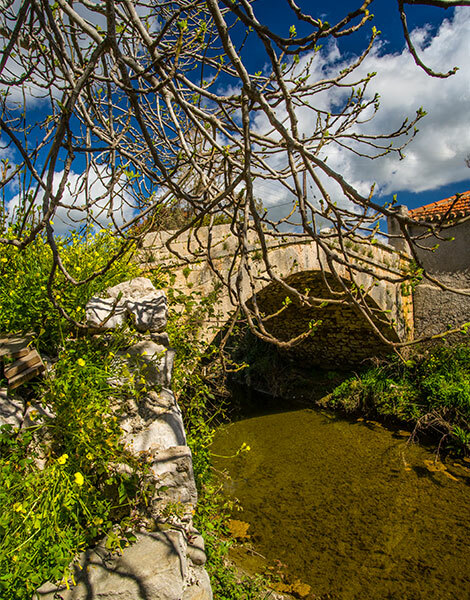 A stone-built bridge in Methoni. The catacombs of Saint Onoufrios. The Dutch chef Hans Kloek has nothing but praise for the food in the local tavernas, as well as for their prices. The British woman Judith Martin is obsessed with Greek traditional dances and is a mainstay of the dance group of the cultural association. Together with her husband they also participate in the choir and are grateful for the view of the sea they get from their window every morning, and for their small garden. Many of these new residents of Methoni are active walkers and tend to the paths in the area. 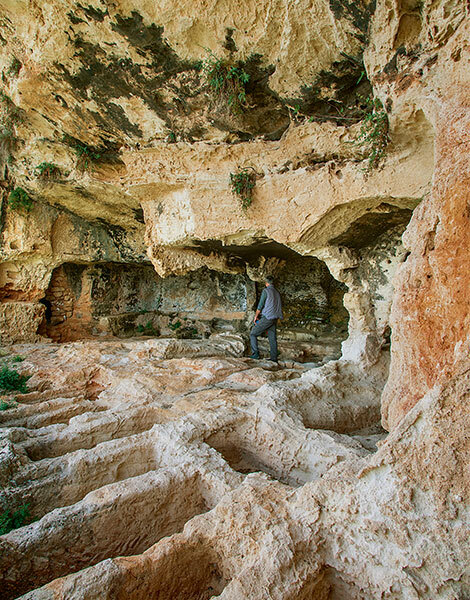 The fact is that there are many beautiful spots to explore, such as Iliodysio behind the castle with its gorgeous sunset, and the Catacombs of Saint Onoufrios which are located 20 km away and can only be reached by foot or 4×4. Here hermits lived from the 5th century onwards, and on the rocks you’ll see fragments of murals. A favorite spot for windsurfers, the beach of Methoni fills with colorful sails and athletic bodies ready to do battle with the elements and to temporarily soar over the waves whenever the wind picks up. 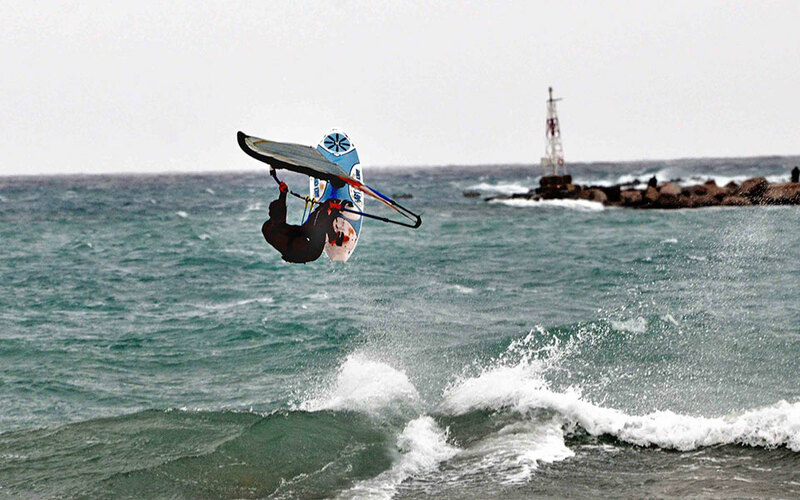 “In November 2007 the conditions were so good that half of Athens came down to Methoni,” says windsurfing fanatic Giannis Petrakis who, as a resident of Methoni, frequently gets out on the water. He explains that the beach is suitable for beginners thanks to the sandy seabed, but also for advanced surfers. Southerly winds create conditions more suited to kitesurfing, whereas northwesterlies kick up waves for wave-riding. For those interested in classic surfing, Koroni is the place to go. For water-sports enthusiasts looking to get out on the water in Methoni and Koroni, visiting the Facebook page of Windsurf Team Methoni is a good way to make contact with the locals. It is not clear when construction of this fortress began, but it continues to be inhabited to this day. Its population consists of 4-5 families who maintain their low-ceilinged homes, and the five nuns of the Monastery of Timios Prodromos which is open to the public from 8:00 in the morning until sunset, with well-kept gardens and vantage points offering panoramic views. Opposite is the church of Aghios Haralambos which is being restored after being damaged by a fire. It was initially built as a Catholic church, then was converted to an Ottoman mosque, before becoming an Orthodox church. Walking in the castle you will come to slopes – covered in wildflowers in the spring – with open views of the sea. 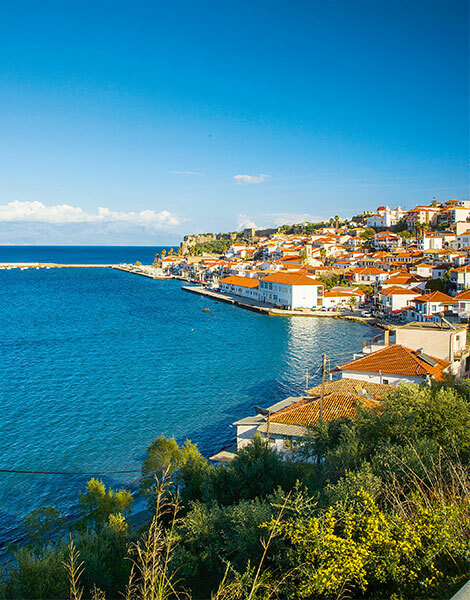 Built around the castle and its port, Koroni has maintained its traditional color both figuratively and literally. 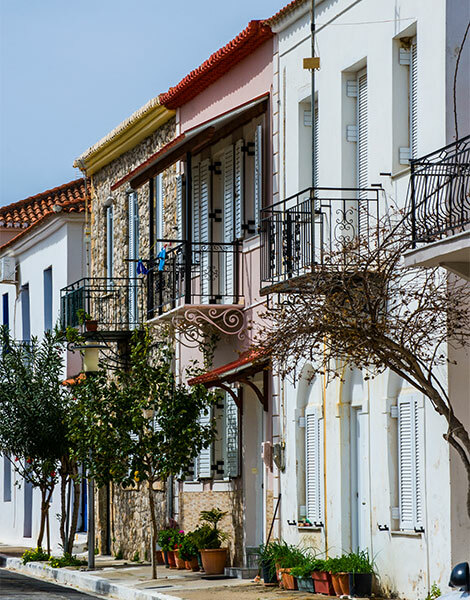 The town has many well-maintained stone-built mansions; while some are unpainted, many others have been given bright colors and feature the fine metal corbels characteristic of southern Peloponnesian architecture. 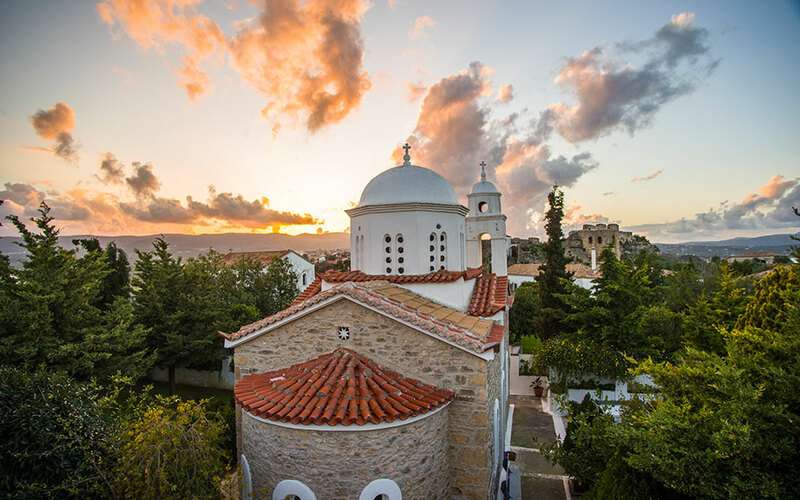 One standout is the Maniatakeion Foundation, a cultural center created to promote the local heritage of Koroni and which hosts interesting events and temporary exhibitions. Together with the local municipality, it co-organizes the Mediterranean Diet Festival, celebrating the cuisine that has been inscribed in UNESCO’s Representative List of the Intangible Cultural Heritage of Humanity. Even if you don’t manage to catch the festival, try olives of the eponymous Koroneiki variety – considered one of the best in the country – as well as their oil which, together with other local products, is credited with bestowing the residents of Koroni with good health. Koroni and its castle, which is like a natural extension of the rock. Shoemaker Manolis Kavalarakis at Koronis' “ Tsagkaradiko”. Daily life revolves around the children’s playground at the port, the fishing boats that attract flocks of squawking gulls, and Periklis Rallis Street with its small shops and two traditional barber shops. “In the summer middle-aged gentlemen from Europe come, where shaving with cut-throat razors has been forbidden, and they place themselves in the experienced hands of the barber. Afterwards, their wives pepper them with kisses, loudly admiring their soft skin,” shop-owner Spyros Leftakis owner says. 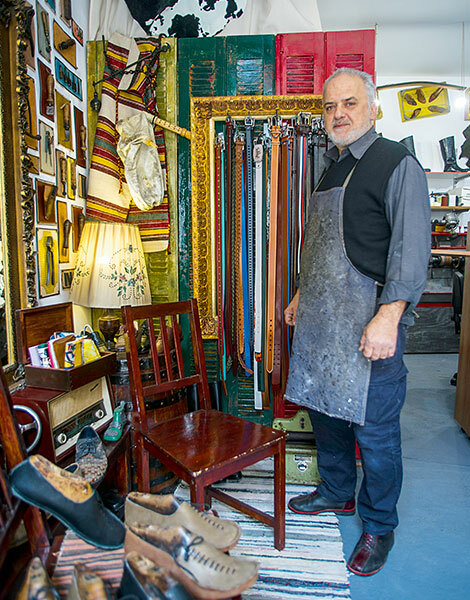 Next to the church, the “Tsagkaridiko” (Cobbler) and its interesting collection of retro shoes and bags sparks a conversation with its owner, Manolis Kabalarakis about the serenity of daily life in Koroni, where he moved with his family three years ago. This is how time flows here: with mezes, a relaxed schedule, and good company. And with plenty of extra work for its residents in July and August when its streets and beaches fill with visitors. Zagka Beach, located beneath the castle of Koroni and a portion of Memi Beach are favored nesting sites for the sea turtle Caretta caretta. On this particular stretch of coast about 45 nests are observed every year. 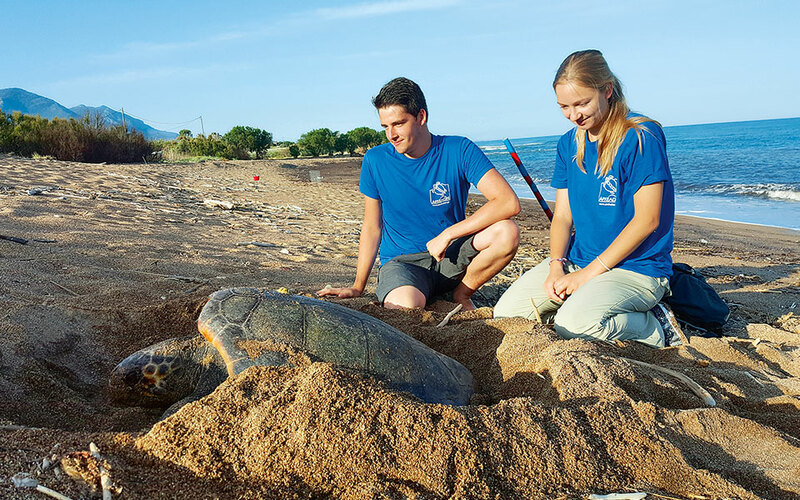 As the biologist, Polymnia Nestoridou from the environmental organization Archelon explains, in the spring sea turtles arrive in Greek waters where they mate at sea. The females then lay their eggs on the beaches from late May, with hatchlings emerging in early September. To volunteer in observing and protecting the nests and informing swimmers, contact Archelon. Sapientza, the small island opposite Methoni belongs to a cluster of island’s known as the Messenian Oinousses. 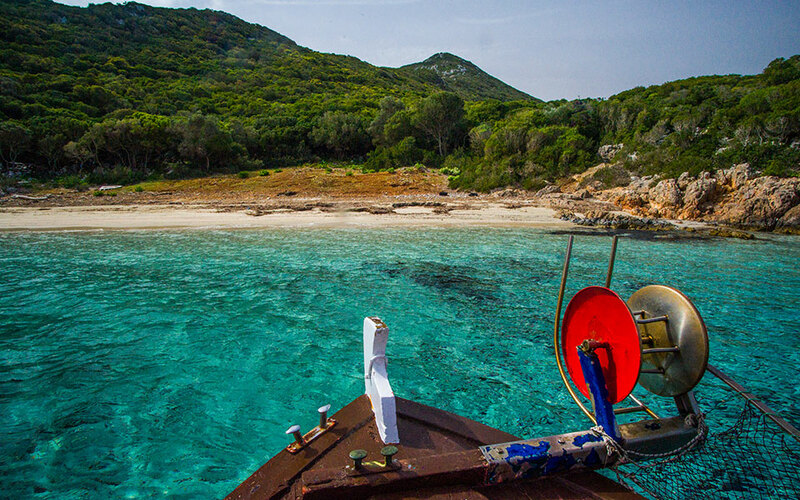 One reaches it via boat from Methoni’s harbor, with prices depending on the season and whether you hire a boat exclusively for your group or will be traveling with others on planned routes. In general plan for about 15 euros per head. On the island, you will find the small beach of Ammos lapped by cool, emerald waters, a lighthouse on the southern end of the island and charming creatures of the animal kingdom such as wild mouflon sheep, partridges and pheasants. But it stands out chiefly as being the home of a significant number of the rare Cretan wild goat (Capra aegagrus cretica). Sapientza is the only place in Europe where – usually every November depending on the local conditions – controlled hunting of this animal is allowed. This makes Methoni a destination for game hunters from all over the world – and especially the US. The island is a restricted hunting area meaning that hunting is only allowed in the presence of a forestry official. For details contact the Forest Directorate of Messinia (which has its headquarters in Kalamata) at tel. (+30) 27210-22510 and (+30) 27210-63040. Niriides Luxury Villas (tel. +30 27230-28787). Self-catering fully equipped apartments in an estate close to the beach of Methoni. Features a swimming pool for young and old, a restaurant that also operates independently, friendly reception and very good facilities for people with disabilities. Ideal for families with children. Prices for an apartment range between 55-140 euros. La Sapienza Hotel tel. (+30 27230-31880). This hotel stands out for its location, built on a hill with a view of the bay and the castle, and for its serenity and sunsets. Studios and apartments are available. The hotel has a large indoor pool and a pool bar. From 50 euros. Koroni Village (+30 27250-22671). Studios and apartments available, ideal for families. Features a children’s playground, parking and a mini market. From 50 euros. Hotel Diana (+30 27250-22312, 6974-903678). A central hotel with standard amenities. From 50 euros for a double room. The restaurant Bogris (+30 27250-22947) is open daily all year round and serves tasty slow-cooked dishes, and fish and meat cooked to order. O Kagkelarios (+30 27250-22839) offers fresh fish and other seafood, slow cooked dishes and cooked-to-order dishes. The tavernas Kastro (+30 27230-31888), Palia Istoria (+30 27230-31812), Nikos (+30 27230-31282) and Meltemi (+30 27230-31187) have home-style cooking, particularly in their slow-cooked dishes. Also try Klimataria (+30 27230-31544) in a courtyard next to the castle, as well as any of the tavernas on the square which are now fully open for the summer period.